All transactions are safe and secure with a reliable history in online purchasing behind each of our associates. Buy the Break yo'self fool! Superbad t-shirts to own Superbad clothing and merchandise. Some of the best Superbad quotes are delivered by Fogell (a.k.a. McLovin). 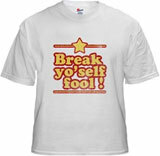 The fronts of these Superbad t-shirts feature the funny movie quote, "Break yo'self fool!" Fogell says this as he's shooting Slater and Michaels' cop car. The two officers let Fogell shoot the car after the three of them go joyriding and set the car on fire with a Molotov cocktail. In addition to the Break yo'self fool! Superbad tees above, browse the Superbad Clothing Gallery for more apparel like men's and women's clothes, kids shirts or hoodies.